A very warm 43°C track temperature greeted drivers at the Nurburgring for qualifying this afternoon. A session dominated with drivers struggling for a consistent rear balance (it was some 5-6c hotter than FP3) was triumphed with yet another blitzing pole position by Lewis Hamilton. The Britain’s 1.29.3 was almost two tenths faster than the RedBull of Sebastian Vettel, with the German’s team-mate, Mark Webber, rounding off the top three. Ferrari looked to be hoping for a strong first stint for tomorrows Grand Prix as they start 7th and 8th but crucially on the medium compound tyres. Q1 was very a slow starter with no-one in any hurry to hit the track. The front runners all waited until the 10 minute mark to really stretch their legs and therefore it was left to Daniel Ricciardo in his Torro Rosso to head the field with a 1.31 flat on the soft compounds, ahead of both Williams cars. Both Paul Di Resta and Adrian Sutil, who were hoping for big things after some front wing upgrades on the Force India car this weekend, were struggling tremendously with balance in the hotter conditions – Sutil complaining over the radio in particular in regards to oversteer. Ferrari and Lotus thought it was best to head straight on to the softer compound for their first runs of the day, and with 5 minutes to go Raikkonen headed Alonso on a 1.30.6. RedBull and Mercedes were more confident only setting runs on the medium tyres. Nestled in the top 10 they felt it unnecessary to go back out. One man who was under pressure however was Perez who was 18th with one minute to go. 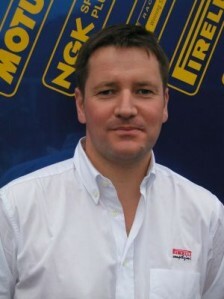 On his final run he managed to string together a brilliant second and third sector, after a mediocre first, to go 14th and out of the bottom six. This however pushed out the troubled Williams duo who seemed very subdued. 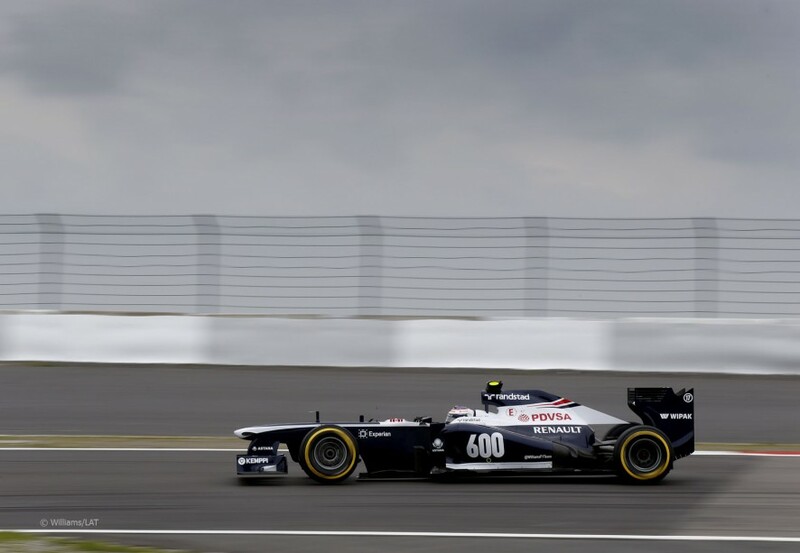 The only light point was for Bottas who out-qualified his more experienced teammate Maldonado. On their 600th race weekend the team have little to celebrate and were joined in the bottom 6 by the two Caterhams and Marussia’s – Charles Pic taking the bragging rights going two tenths clear of Jules Bianchi – the upgrades for Caterham working well this weekend. For Q2, a lot of the drivers were much more eager to get an early lap in. The whole grid was now on the softer compound tyres, and it was the Lotus of Kimi Raikkonen who topped the time sheets early on with a 1.30.5. A lot of the front runners were finding it hard to get to grips with the softer compound tyre and Rosberg made a mistake on his first run going into turn 1. His teammate however was really starting to show his hand, Hamilton toppling Raikkonen with a 1.30.1 to lay down the first proper marker to chase. This was with 8 minutes left and RedBull who were expected to be Mercedes biggest challenger for pole had not appeared yet – one run looked to be planned and showed the confidence both drivers had in the speed of the car. Vettel who had yet to start on the front row at the Nurburgring then displaced Hamilton at the top of the time sheets with a 1.29.9 – the first man to break the 1.30 barrier in the session. The final minutes were chaotic as everyone it seemed were eager to improve, and Massa, Raikkkonen and Alonso immediately jumped into the top 3 on their final runs. One man who didn’t go out was Rosberg however. The Mercedes man sat 6th and felt it was satisfactory to get him into Q3. But the track was evolving quickly and as the checkered flag dropped, the German dropped like a stone to 11th and more crucially out of qualifying – a key strategic mistake by the Mercedes team and not the first of that kind they have made in the past 2-3 years. Joining Rosberg in the qualifying drop was the struggling Di Resta in 12th, Perez 13th, Guttierez 14th, Sutil 15th and Vergne in 16th. But the star of the session had to be Nico Hulkenberg who managed to drag his Sauber into Q3 on merit. With Rosberg out of the equation, the shootout between pole position looked very much like a battle between Hamilton and the two RedBull drivers. Ricciardo and both Ferrari’s were first out, however on their first runs all 3 cars pulled into the pits after their initial warm up lap – on scrubbed soft compound tyres. 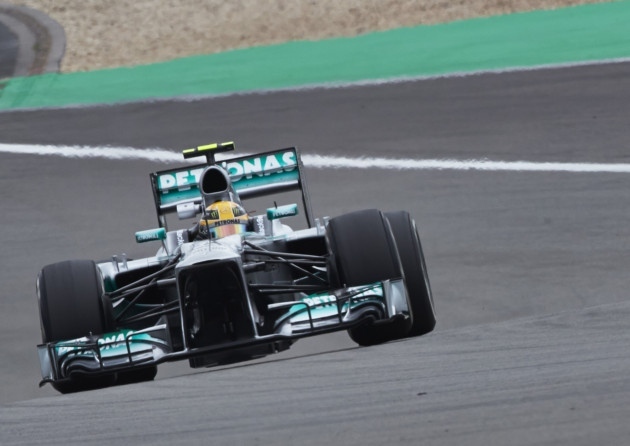 Hamilton took the early initiative with a fantastic 1.29.5, one tenth ahead of Vettel with Raikkonen 3rd. With half of the 10 minute session left, both Ferrari’s then remerged on the medium compound tyres. Prepared it seemed to concede qualifying in the hope of a stronger race pace in the first stint for tomorrow’s grand prix. For pole position it came down to a frantic shootout in the final seconds. Vettel was the first to blink and went half a tenth clear on a 1.29.5 flat. Webber was next to blink and could only manage 3rd 1 tenth off – but held station ahead of the lotus of Raikkonen. All focus therefore shifted straight onto Hamilton. Blitzing an incredible final lap he went 3 tenths clear of Vettel to claim a magnificent pole position – the 29th of his career. 4th and 5th were the Lotus pair of Raikkonen and Grosjean. Ricciardo rounded off yet another strong qualifying with a solid 6th place after a difficult start to the weekend. 7th and 8th were Massa and Alonso, the Brazilian managing to outqualify his team-mate with both drivers on the medium compound tyres. 9th and 10th were Button and Hulkenberg who did not set competitive lap times and therefore have free choice on tyres for tomorrows grand prix – I fully expect them both to start on the medium compound tyres tomorrow and run a longer first stint. Pirelli’s motorsport director Paul Hembery said: “There was a difference of over a second between the medium and soft compounds, which obviously had an effect on the chosen strategy for qualifying, as it will do during the race tomorrow. The soft tyre was definitely the tyre to qualify on but those who start the race on the medium tyre might be able to gain track position when the soft tyre runners come in for their first stop earlier than them. We’re expecting most people to stop twice, with the emphasis on the medium tyre during the race: and that will be at the heart of the race strategy that the teams plan tonight. Track temperatures were high today during qualifying, with comparatively little grip, which gave the drivers a delicate job to get the most out of the tyres and ensured that the timing of each qualifying lap was extremely important. The quickest strategy for tomorrow’s 60-lap race is set to be a two-stopper. Start on the soft tyre, change to the medium on lap five or six, and then to the medium again on lap 32 or 33. Alternatively, for those starting on the medium, it could go as follows: Start on the medium and then change to the medium again on lap 27. Change for a mandatory final stop for the soft tyres on lap 54. It is set to be a fascinating race tomorrow. +0.103s is almost two tenths??? Of course – it’s less than a tenth off two tenths ! Interesting qualifying session. Lotus did a whole lot better than I thought they would, but thinking about it now : the track temperature was hovering around 30-35 degrees C and they were also able to use the softer compounds, after a few races on the harder ones, so that definitely played in their hands and they were able to show some of their true pace. The biggest surprise came from Mercedes. First of all, they totally blew it with Nico Rosberg who ended up 11th and had more than enough pace to to be Top 4 today, but they got mugged by the fickle nature of the track today. McLaren were barely doing high 1.30s and Button did a 1.30.2 at the death, so he gained easily 0.5s, likewise Ricciardo and many other drivers. Ferrari were quickest too, by doing one-lap runs at the death so it was an unusual set of circumstances that eliminated Nico Rosberg. But he has a fine car for tomorrow I think, he should easily get back in the Top 5. Secondly, Hamilton. Now that was some turn around, I’m still flabber-gasted. He was over 0.5s down on Nico in FP3, and somehow Mercedes and Hamilton worked out a setup combination that gave him the car balance he was after. In qualifying, he looked revitalized and suddenly it looked as if he could hit a front-row position again. I was absolutely convinced he’d struggle to make Q3 based on FP2 and FP3 sessions that I watched. Stunning pole-lap from him, not perfect by the way : he still had to fight the car in some turns, but all drivers had to fight today, such was the nature of the track. Red Bull look like the strongest bet for the race. While Hamilton stuck it on pole, he had to change his setup and by doing so : he may have altered in race-pace somehow. That’s the unknown in his case, he could be competitive vs Red Bull or he could drop like a stone ala Barcelona. We’ll know tomorrow, but he should get credit for his one-lap pace. Lotus are the other very strong bet for the race, they start right behind the Red Bulls, no Ferraris to bother them so they are in a very favourable position. I would like to also highlight that both Vettel and Webber look extremely strong on race-pace and their qualifying performance were pretty awesome. Webber could have nabbed pole had there been no Ferrari in front of him, but that’s up to speculation, I think he had enough to do a 1.29.3 himself, likewise Vettel but his first sector was difficult. All drivers struggled with over/under-steer at various parts so Q3 was a very delicate exercise and Hamilton performed best. Good for him. Finally : Ferrari going for the medium tyre straight into qualifying. Unusual but very interesting. Ferrari are always strong on race-pace so they might as well do that exercise more often than not : run the harder tyres first and the softer one at the very end. Very interesting. I still Red Bull and even Lotus to monitor the gap nicely tomorrow (with Hamilton’s situation being a complete unknown) but Ferrari’s race will be one to watch out after Lotus’. To conclude, it looked like the tyres are holding well enough, we’ll only know tomorrow whether they really benefit RB/Merc or Ferrari/Lotus, but if the temperatures are high-ish, I’d say Ferrari/Lotus have a very decent chance to take the win, otherwise Red Bull look like they can sew up the win fairly comfortably, unless Hamilton has diabolical pace and reasonable tyre degradation. The track is also proving difficult to master for everyone : all the way till Q3 the drivers were struggling to really get the perfect balance for the perfect lap, so it’s proving to be rather challenging, unlike what Jean Alesi was trying to imply. Gives an interesting spin to all the moral posturing of the last few weeks. 1. Hi KimKas… I’ve been enjoying your posts over recent weeks but now, as they get longer, I wonder if you shouldn’t be writing full articles… How about it, Judge…? I was surprised by Lotus’ pace and Ferrari choosing to run the medium tyres. That just got me thinking and the race should very tactical. I still think Red Bull are the safest bet for the win. I would love to see Hamilton win but I will keep my expectations on hold. Yep, Rosberg definitely had enough to do a 1.29.3 I think, but the margins were very small. Hamilton effectively did a 1.29.4 (398 is closer to 400), Vettel did a 1.29.5 flat, Webber did a 1.29.6, so 2 tenths were enough to place you 4th or 1st. But a 1.29.3 would have required a perfect lap, all drivers in the top 3 had some mistakes here and there through their final qualifying laps. Unfortunately Ross Brawn and the race engineers didn’t realize until it was too late that the track was really going super fast. I watched the highlights, some people gained almost 1s over their first lap ! 1s ! It’s huge, I mean, had Nico gone out and done just one lap, he probably would have nailed at least a very low 1.30, which would have been more than enough for Q3. LOL… I want Webber to win (sacrificing my GP Predictor). Lewis was up 2 tenths just before a big snap oversteer coming out of turn 10, I think he was a bit wide here or there, but otherwise he was pretty on it, so without that he’d have got a 1.29.3 flat probably. So I think you are right, in that a 1.29.3 or a 1.29.279 or something was probably about as good as it could have got today. I honestly thought this was going to be a red bull vs rosberg shoot out, and judging by all the protagonists faces afterwards so did they. So much for my Vettel pole is the castrol GP predictor. LOL, I should have stuck with my gut feel. Had Ham as pole and changed to Vettel. Rosberg was behind Hamilton at every stage of qualy. Not sure why you think he had more in the bag than Hamilton did. Front row? Sure. But I wouldn’t say with any certainty that he would have beaten Hamilton. Lewis was just on it in Q3. But who is to say that Rosberg would not have made an error in his Q3 rub as he did in Q2 ? 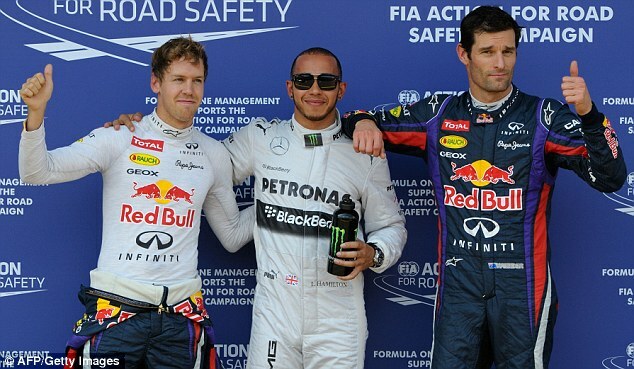 Mark Webber in that title picture, completely hilarious. His facial expression… classy! LOL @ Don Quixote I sacrificed my GP Predictor by foolishly watching FP2 and FP3. Never Again!!! I think both mark and Seb had a chuckle over the “P Diddy” shades Lewis was wearing!! I too was in hysterics. How much did he get paid for that – or is it just an image that he is trying to maintain. Yeah, I don’t think the drivers should be wearing shades at these times, when doing interviews etc. Doesn’t make ’em look cool, just insecure and a wee bit shallow. Good job they don’t allow them on the podium. Quick word : the race just finished. Vettel won, ahead of both Raikkönen and Grosjean. Alonso a close 4th. Hamilton was eventually hampered by the +40°C temperature of the track and was only 5th. Bit low-key given I was hoping Hamilton would be closer to the top, but this was a reminder that Mercedes still have quite a lot of work to do with managing tyre temperature, especially when it’s not the hard tyre. So far : it’s only when the hard tyre was around that we’ve done well. Congrats to Vettel and Red Bull though, they were awesome and the top boys. Vettel had to work very very hard for this win, but they had the pace, magnificent start for both RBs to overtake Hamilton, then Vettel just did his race on his own, like he knows how to do. Lotus somehow always fall one step short even when the conditions seem perfectly good for them.